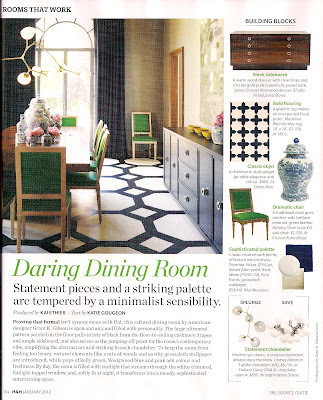 I am thrilled that the dining room that I designed last year for the San Francisco Decorator Showcase was recently featured in the Canadian House & Home- January, 2012). If you are not familiar with the magazine, I highly suggest picking up a copy (I see it at news stands all of the time). It is always filled with great ideas! Statement pieces and a striking palette are tempered by a minimalist sensibility. Proving that formal isn't synonymous with flat, this refined dining room by American designer Grant K. Gibson is open and airy and filled with personality That large ultramodern pattern painted on the floors pulls in hits of black and from the floor to ceiling cashmere drapers and ample sideboard, and also serves as the jumping-off point for the room's contemporary vibe, amplifying the abstract art and the striking branch chandelier. To keep the room room from feeling too heavy, natural elements like a mix of wood and earthy grasscloth wallpaper are introduced, while pops of kelly green, Wedgewood blue and pink add colour and freshness. By day, the room is filled with sunlight that streams through the white- trimmed, fanlight- topped window, and, softly lit at night, it transforms into a moody, sophisticated entertaining space. Adore this dining room Grant! Congratulations! I will pick up a copy! The color palette is very striking! Grant - I saw this featured and absolutely adored it! That Kelly green is exquisite (I'd love to know what fabric you used) and the painted floor has fully inspired me. Congrats on the feature! CONGRATS GRANT! That Dining Room is ultra chic! 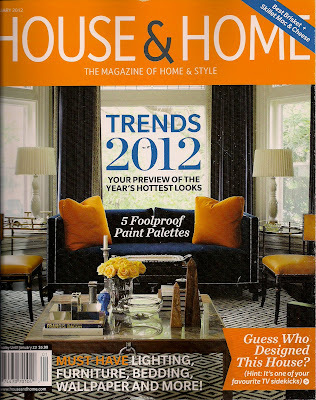 I love Canadian House & Home and I love your design. Fresh and unique, well done! Congrats - I was very excited to see your dining room in House and Home! I've subscribed since 2000 and for the very first time I saw the magazine in our Safeway grocery store, right alongside BHG, etc. (in the past it was only in bookstores here) I think they may be picking up a larger market share in the US now. So happy for you Grant!!! 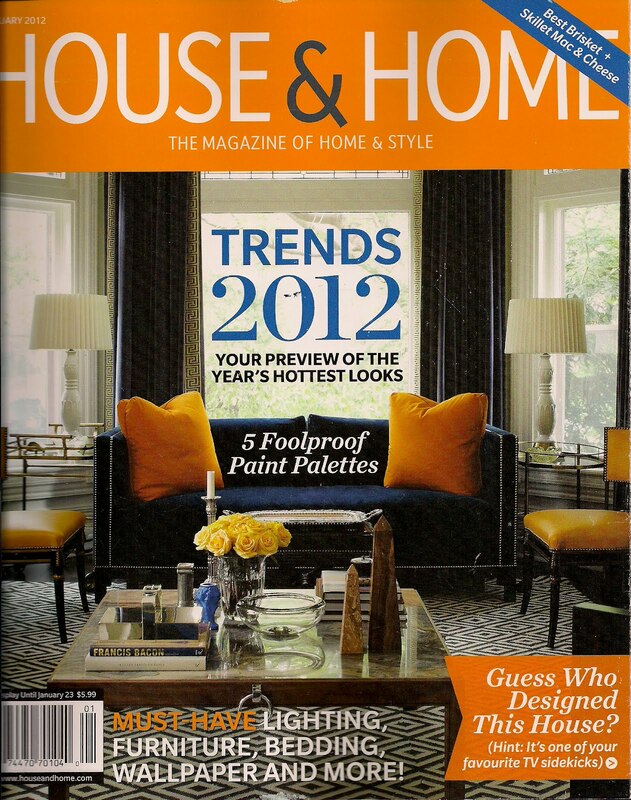 Congratulations on winning the CH+D award for Showcase House Design for 2012! I loved that room, and I'm thrilled you're getting so much recognition for it. Yea! Congratulations Grant - truly a highlight of Showcase! Your dining room is beautiful. I am interested in purchasing the same light. Are you able to give me the supplier ( based in South Africa ) or am I able to order it through you? You can be in contact with my office and we can help you with the light fixture.